Electrical engineering is a specialized field. As such, it can be difficult to find a business in need of your particular skill set. Interviews in this field are often high-stakes and stressful, requiring a confident working knowledge of everything from network theory to integrated circuit design. Maybe you were feeling under the weather, or perhaps your nerves got to you; there are dozens of ways to flub an interview when you aren’t at your best. Here, we’ll go over a few tips and tricks to help you get back on your feet after an interview goes wrong. Your dream job hasn’t slipped through your fingers just yet; there are measures you can take to regain favor with your chosen company. First and foremost, give yourself some time to reflect upon what exactly went wrong. It’s imperative to recognize the issues and problems you encountered in your interview, so that you can troubleshoot and plan ahead for the rest of your interactions with potential employers. For example, making a mistake in the standard domain doesn’t mean you’re unqualified; people make mistakes, and stress can make fools of the most intelligent men. Try to figure out where exactly you were lacking in either ability or communication. The second step in recovering from a bad interview is to let it go. You can’t hold one bad experience over your head; it happened, and you need to move on if you’re ever going to salvage the situation. In most cases, employers will be understanding; they’re human too, after all. The next step is tricky; you don’t want to sound desperate, or to shatter what confidence and ability you showed during the interview. It may take some effort, but the best thing to do, in this situation, is to begin the damage control through your thank-you message. If you’ve already sent one, another email will suffice in most situations. Tailor the email to your particular situation: if a question stumped you on the first run, make a reference to it and provide a more polished answer at this time. In some cases, such as using the wrong name, it’s best not to mention the mistake. Make sure you have the correct name in the email, and thank them for the opportunity to interview. The most important aspect of this letter is that you do not admit to any particular mistake. Doing so may root the situation into the employer’s minds, and they may count you out whether or not you’re qualified for the position. If all else fails, take this unsuccessful interview with a grain of salt. 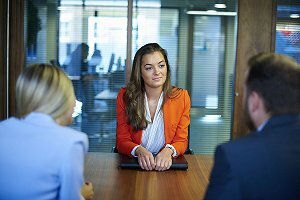 Use the information you gathered to improve upon your interview techniques. Do research and prepare for any questions you hadn’t expected. Other employers will have an entirely different interviewing style; it could be that this particular company just wasn’t right for you. The right job is waiting for you; keep looking for it, and it will find you.